Full automatic fabric spreading machine is the upgrade version of semi-automatic spreading machine. It has great importance in apparel manufacturing sector. In the past we have discussed about the advantages and disadvantages of semi-automatic spreading machine. Now this article has shown various advantages and disadvantages of full automatic spreading machine which will be very effective for all the persons related with readymade garments sector. Full automatic fabric spreading machine is the improvement of semi-automatic spreading machine. There are a lot of advantages of this machine to make fabric lay. Because, this spreading machine is operated by controlling with the help of micro processor and robot. Here, m/c can be set before the expected amount of plies spreading. After completing, fabric spreading will stop automatically and give a signal. By using robotic system, it will automatically come to the end of table and set another roll in the spreading head when spreading of each roll is finished. 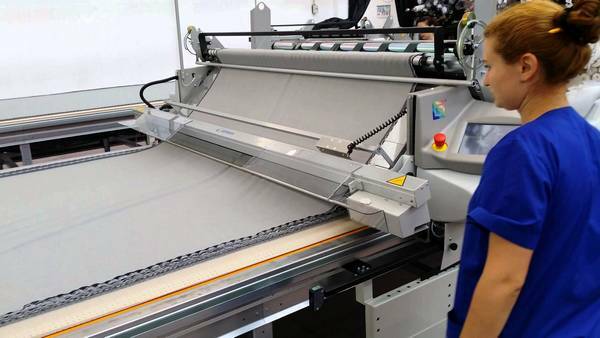 It is automatically spliced and starts new fabric spreading where the last fabric roll has finished. There is a spreading head, so that any types of fault are identified by using this sensor and also the spreading head is stopped and the defective fabric is cut by itself. Any kinds of fabric can be spread by using this machine and any kinds of lay can be made. Less time is needed here for fabric spreading. Also it needs less labor cost. It is very expensive, so that capital investment is high. Skillful operator is needed to operate this types of machine. How can solve the edge up down of spandex fabric during lay time when cuttable width become some variable due to taking relax 18 to 24 hrs. ?